I’m a nightmare when it comes to eating fried rice. I will silently pick through the pile (which always seems to be 95% rice, 5% everything else) and fish out every last morsel of vegetables, chicken, shrimp, and egg in an attempt to create my ideal ratio of grains to goodies. Feel free to call me out; I’m not ashamed. Today’s Quinoa Fried Rice recipe is a different tale. Every forkful is fully loaded with the good stuff, no extra picking required! Quinoa Fried Rice is a meal I made at least once a week for Ben and myself when we were first married. Then, I became distracted cooking other things (all 800+ of these healthy recipes perhaps? ), and it fell off our usual rotation. Last week, I was digging through our freezer (always an adventure) and found a big container of cooked quinoa I had stashed away. We also had a few straggler vegetables and a casual chicken breast hanging out in the refrigerator, awaiting their purpose. Like finding $5 in a pair of jeans or a forgotten shirt hanging in the back of a closet, I felt the joy of rediscovering something I once loved. We had Quinoa Fried Rice for dinner that very night. It tasted new and exciting and even more delicious than I remembered. 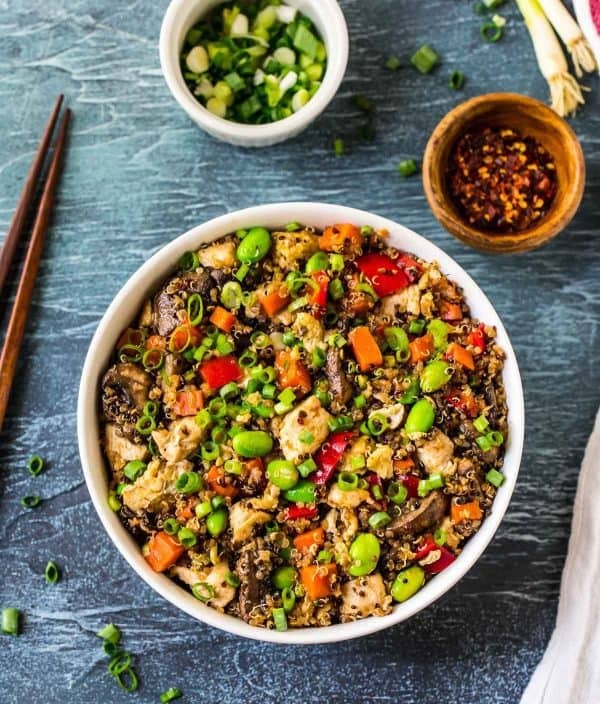 Quinoa Fried Rice is essentially the same idea as regular fried rice (just replace the cooked rice with cooked quinoa), but nothing about it tastes “regular” at all. Quinoa Fried Rice, Game Changer Part 1: The Ratio. I know we already discussed this, but I must say it again. Most restaurant fried rice is overpriced, underwhelming, and sorely lacking in tasty mix-ins like vegetables, eggs, and chicken or shrimp. I’m forever tempted to order it based on potential alone, but it lets me down every single time. To be fair, fried rice is usually meant to be a side dish and not a main, but if I’m going to the trouble to cook vegetables, meat, eggs, AND a grain like rice or quinoa, you best believe I want a full, hearty meal in exchange for my effort. This Quinoa Fried Rice delivers. It’s a one-pan plan that hits every food group. I elected to make my Quinoa Fried rice with chicken because that is what we had on hand, but I think Quinoa Fried Rice with shrimp would also be super yummy. For a vegetarian version, you could use tofu (this Crispy Tofu would be perfect) or simply omit the meat all together. For vegetables, I used carrots, mushrooms, and bell peppers, which are nutritious, beautiful, and give the Quinoa Fried Rice a colorful, almost confetti-like appearance. Quinoa Fried Rice, Game Changer Part 2: Protein. 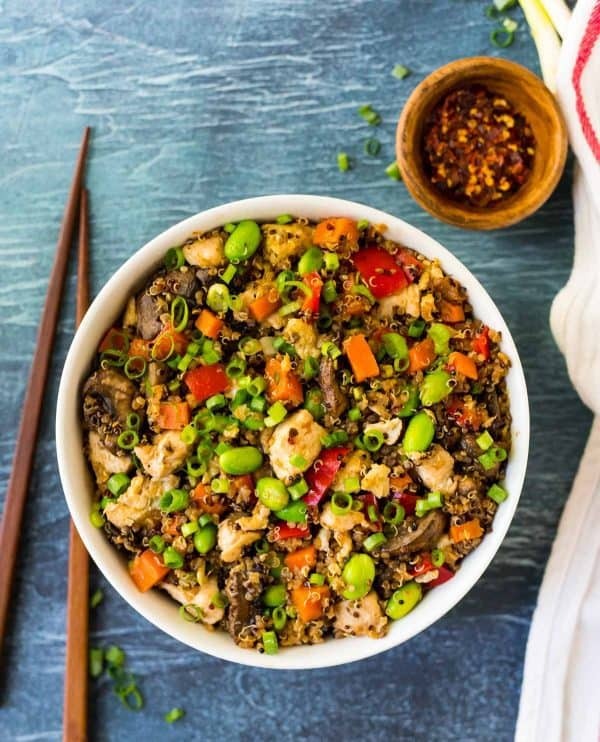 A key element to making this Quinoa Fried Rice tasty and satisfying enough to be a full meal is protein. 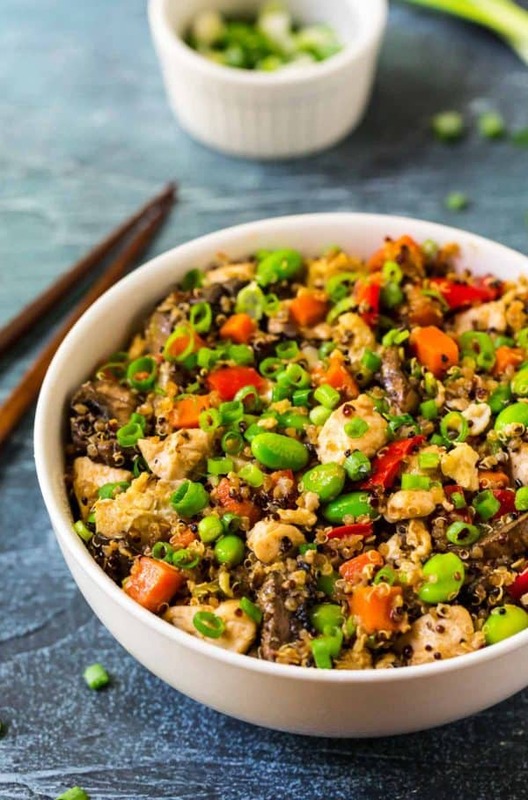 Even if you omit the chicken, it still is protein rich, thanks to the quinoa itself (which is higher in protein than rice), eggs, and edamame. Bring a container of this leftover-friendly Quinoa Fried Rice for lunch and you’ll stay full and happy all afternoon. Quinoa Fried Rice, Game Changer Part 3: Simple Fresh Ingredients + Pantry Staples. For this quinoa stir fry recipe, you don’t need to make a separate sauce. Instead, add a few fresh and pantry ingredients right to the skillet. Easy-peasy. The fresh: garlic; ginger; green onion. Don’t overcomplicate this. They are perfect just as they are. The pantry staples: soy sauce (I use low sodium to ensure the recipe doesn’t become too salty); toasted sesame oil (INCREDIBLE flavor right of the bottle; it’s sold in the Asian food aisle of most grocery stores); as many teaspoons of garlic chili sauce as you dare (this sauce is also called Sambal Oelek and is sold in the Asian food aisle). I learned this tip from my friend Ali’s recipe for regular fried rice and have used it for my Quinoa Fried Rice ever since. In order for the quinoa to crisp up when it hits the hot pan, it needs to be COLD. Even an hour in the refrigerator can make a difference. I like to cook the quinoa a day or two ahead (or even freeze it). It creates a better final product and saves me a step on the night I make the Quinoa Fried Rice. TWO: Make Sure You Have BIG, Sturdy Skillet. I bought myself this wok right after I graduated college (a splurge, especially back then) and have loved it ever since. 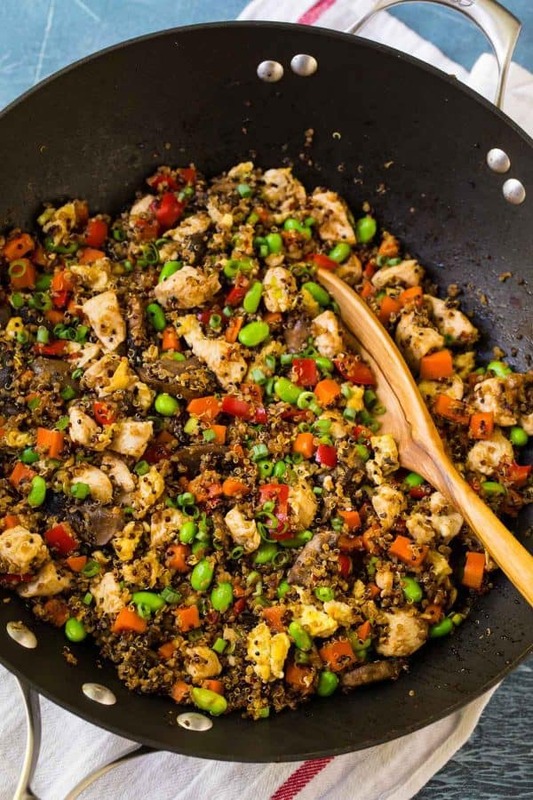 You certainly don’t have to have a fancy wok to make Quinoa Fried Rice; just make sure your skillet is large (all the goodies in this recipe means it yields a lot!) and can withstand high stir fry heat. I promise the only “picking” that will happen with this Quinoa Fried Rice recipe is when you catch yourself snitching forkful after forkful straight out of the fridge! 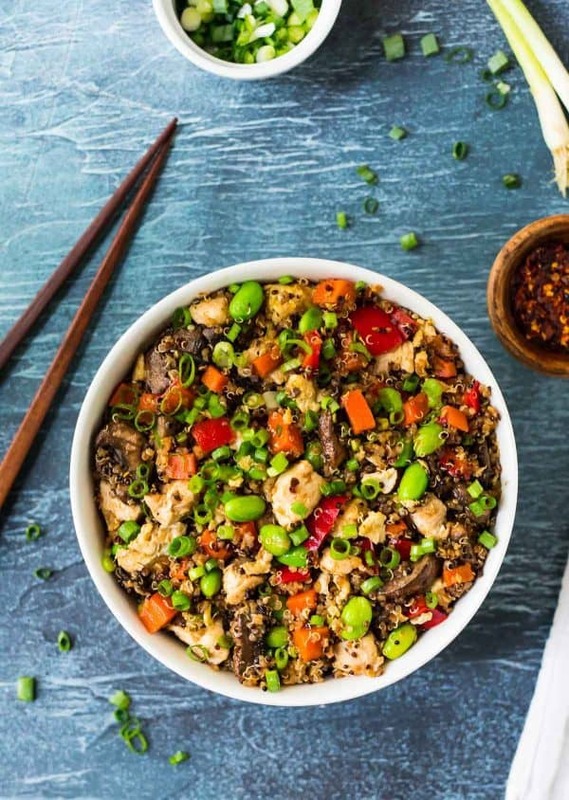 Healthy Quinoa Fried "Rice" with chicken and vegetables. Easy, delicious and packed with protein! Better than take out and great for meal prep and leftover. Heat a large skillet or wok over medium high heat and add 1 tablespoon of the olive oil. Once the oil is hot, add the chicken. Cook until the chicken is browned on all sides and cooked through, about 5 to 6 minutes. Remove to a large bowl or plate and set aside. Pour out and discard any juices that have collected in the bottom of the skillet. Reduce the heat to medium. Add 1 tablespoon olive oil, the mushrooms, carrots, and bell peppers. Toss to coat the vegetables in the oil, then cook, stirring occasionally, until the mushrooms are browned and the bell peppers and carrot are crisp-tender, about 8 minutes. Stir in the garlic and ginger and cook just until fragrant, about 30 seconds. Remove the vegetables and any juices that have collected in the skillet to the plate with the chicken. Add 1/2 tablespoon olive oil to the skillet. Add the beaten eggs and cook, using a spatula to constantly stir and break apart the eggs into small pieces. Remove the cooked eggs to the plate with the chicken and vegetables. Add the remaining 1 1/2 tablespoons olive oil to the skillet and increase the heat to high. Add in the quinoa and stir to coat it with the oil. Spread it into as flat of a layer as you can. Let it cook undisturbed until it’s toasted and golden on the bottom, about 1 to 2 minutes. With a large spatula, flip it in large sections so that fresh, uncooked portions are touching the bottom of the pan. Repeat cooking and flipping 1 to 2 more times, until it’s nicely toasted throughout. Stir in the soy sauce, sesame oil, and chili garlic sauce and stir until the quinoa is evenly coated. Add the chicken and vegetables along with any of the vegetable juices and edamame. Stir to combine. Stir in the green onions, then reduce the heat to low. Let cook, stirring occasionally, until warmed through, about 1 to 2 minutes. Taste and adjust seasoning as desired (this will vary based on how salty your soy sauce is and how hot you like your stir fry; I usually dash on a bit more soy sauce and a little extra chili sauce). Enjoy immediately. You can make this same recipe with the same amount of cooked brown rice (or white rice) in place of the quinoa. To make gluten free, use gluten free soy sauce or tamari. To make Paleo, omit the edamame and use coconut aminos in place of the soy sauce. Store leftovers in the refrigerator for up to 4 days. Rewarm gently in the microwave and season with a little extra soy sauce as desired. Freeze leftovers for up to 2 months. Let thaw overnight in the refrigerator. Aimee, I’m not sure how jackfruit would taste in this—I haven’t cooked with it much, but I believe it’s similar to pork? You could try playing around with it or use the crispy tofu I mentioned in the blog post. You can also simply omit the chicken. The recipe is filling without thanks to the egg and edamame. Cindy, I am going to have to look for that too!! Making this after work! Thank you so much, Erin! Looks so tasty!!! I hope you love it Becky!! Need to whip this up, stat. It’s so tasty in fried “rice!” I hope you enjoy it! Made this last night. Added bok choy and omitted chicken since we are vegetarians. Hub who isn’t crazy about quinoa loved it. I will definitely be making this regularly. Thanks Erin. I’m so glad to hear the recipe was a hit! Thanks so much for reporting back. I used brown rice because my husband does not like quinoa. It was really delicious and spicy. We loved it. I’m glad it was a hit, Patty! Thanks for taking the time to report back! This recipe is so good and so easy to make. For someone like me who does not cook a lot this made me very happy and is so tasty! I eat quinoa in place of rice due to a rice sensitivity and this will definitely become one of my favorites. Thank you! Dior, thank you for taking the time to share this review! I’m glad to hear you enjoyed it!